In this article I want to look at what exactly the 19th century philosopher and political theorist Karl Marx had in mind when he talked about alienation, and then examine how this concept might make sense within an existentialist framework (drawing specifically on Nietzsche, Heidegger, and Sartre). As we use it in everyday speech, ‘alienation’ means to be isolated or separated from a group or activity. While this isn’t completely removed from the way Marx uses it, we do need to get a little more specific than this. For Marx, alienation describes the situation in which workers become separated from their humanity through forced participation in a capitalistic mode of production and that humanity then appears before the individual as something alien in nature, something barely even recognisable anymore. Alienation from the product. The modern worker typically no longer works for him/herself. They have no control over what they produce (create) and, in the case of assembly lines, may not even get the satisfaction of seeing the completed product. On one Philosophy Bites podcast, Jonathan Wolff adds that we can also think of Marx here as saying workers collectively are alienated from products collectively. Since workers no longer actually produce goods from start to finish, the world appears as if we are strangers to it. We don’t know how anything in it works. For example, I have no idea how to make the computer I am typing this article on so to some extent it is alien to me. But this doesn’t just concern technology. I don’t know how to make anything around me; from the glasses I wear every day to the water bottle on my desk, or even the pencil in my hand. I have no idea what goes into the making of these products. In this sense, they are all alien to me, and I am alienated from them. Alienation from the act of production. Because of the nature of the work demanded form them, i.e. tasks which are highly repetitive and mechanical, workers essentially become machines, unable to engage their innate desire to express their creativity, will, and consciousness. Work should be the activity in which human beings are at their most human; i.e. when they are wilfully using their creativity and energy to produce something, but in modern society, work has become the exact opposite; a dull, draining, soul-less activity performed against one’s will just to survive. In fact, Marx says that workers are perversely most human when they are away from work; eating, drinking and procreating, in other words, when they are fulfilling their base animal natures rather than their human ones. Alienation from species-essence. Marx has a very specific definition of ‘species-essence’ (Gattungswesen). Most animals are only capable of producing in line with the needs and demands of the species to which they belong; they are nothing more than what they do and they do nothing more than what they are. Humans, on the other hand, by virtue of our (self-)consciousness, are able to rise above this as conscious subjects to make our lives, and even the species we belong to, explicit objects for ourselves. This means that instead of just being what we are, we exist in relation to what we are, and are therefore free to determine ourselves in light of this consideration. It is this that makes our potential to create so much greater than that of other animals. Under capitalism however, this potential is suppressed and alienated from us. Alienation from other human beings. Marx thinks that by nature human beings have the desire and tendency to work with other humans to promote our mutual survival and psychological well-being through the formation of emotional connections with people in society. Under capitalism however, not only do we find ourselves estranged from our fellow-human, seldom even recognising how we are connected to each other through our work, we often find ourselves in direct competition with others as we struggle to secure work which will benefit me at the expense of someone else. The only way alienation really appears in Nietzsche is in his discussion of the herd, in which the individual finds himself apart from the masses. However, for Nietzsche, alienation from others, rather than being a problem, is actually the ideal. His noble, proud, strong ubermensch (commonly translated as overman or the somewhat less appealing, superman) naturally tends towards solitude, finding the company of the herd unnecessary at best and distasteful at worst. It is the nature of the herd to come together for safety, comfort, and peace of mind. This may make them happy and content, but it is not what the ubermensch desire. These latter value spontaneity, exuberance, and vitality. They don’t accept the values of the herd because they choose to make their own and to do this they must rise above the rabble and stand alone. In short, alienation from others for Nietzsche is the mark of the higher individual and something to be valued. In Being and Time, Heidegger discusses what he calls the worldliness of the world. This refers to the world, not as the external, objective matter of physics, but as an interconnected web of tools, each connected to the other in bonds of significance and relevance which make up a referential totality. The referential totality brings coherence to the world, although we are seldom aware of it, and without it, there wouldn’t, couldn’t, even be a world in the first place. Now, I didn’t invent pencils for writing or hammers for hammering and if you gave me a tree and a hunk of metal and whatever pencil erasers are made of, I wouldn’t be able to make either of them, and yet I am familiar with them and the place they fill in the referential totality which I spend my life immersed within. Despite the fact that I can’t produce them, pencils and hammers are as intimate to me as anything in my life is. For Heidegger then, I am anything but alienated from the world and the ‘products’ it contains; on the contrary the things around me make up an essential part of my Being, hence the term Being-in-the-world. Heidegger explicitly talks about alienation in conjunction with his concept of the everyday Being of Dasein or falling prey. The basic idea here is that in our normal, everyday existence, we find ourselves entangled in a world full of other people and things and lose sight of our authentic selves. As Heidegger says, falling prey is alienating because our “ownmost potentiality for being-in-the-world is concealed.” Although Heidegger’s notion of an authentic self is something quite different from Marx’s species-essence, there is still a reasonably close parallel here. Both thinkers see modern life as distancing us from who we really are and both are attempting to bridge this divide. There is one other significant point worth mentioning too. Heidegger, while acknowledging that our everyday Being is inauthentic/alienating and a circumstance we can and should attempt to rectify, nevertheless insists that it is not a “night view” of Dasein. On the contrary, he sees it as an existential, “primordial” fact about human existence. We are, and must be, inauthentic. Authenticity is only what Heidegger would call an ontic modification of this more fundamental condition. We can be authentic but should remember that this authenticity is grounded in our more primordial inauthenticity. Without alienation then for Heidegger, there can be no human being. This seems in stark opposition to Marx, for whom alienation is a condition imposed on us from without and one which we would be better off without. However, it isn’t quite as simple as this. It is true for Marx that human beings need not go through alienation and can purge themselves of it when the appropriate external conditions prevail (unlike for Heidegger), but it is also true that alienation isn’t completely bad. Even for Marx, alienation serves a positive purpose; namely, as a necessary stage on the way to communism. It will galvanise the workers to revolt and eventually bring about the revolution which will end capitalism and usher in a new, better era. In this sense, alienation isn’t necessarily a “night view” for Marx either. In a similar vein to Nietzsche, and largely in opposition to Marx, Heidegger saw our Being-with-one-another as more of an impediment than something to be valued. Heidegger called this pernicious aspect of community, Das man, which has been translated as ‘the they’; a term less sinister than it sounds. Das man refers to the social customs, mores, and values we all find ourselves immersed in from birth. It is the tendency of people to do things the way they do them, to find funny what they find funny, where ‘they’ doesn’t actually refer to any particular person or group of people. In fact, ‘the they’ is paradoxically an anonymous non-entity most of us nevertheless spend our entire lives emulating. Heidegger gives the examples of using public transportation and information services such as newspapers to show how when we are immersed in ‘the they’, we lose our individuality. Anybody can take the bus and it makes no difference to the bus driver whether you or someone else gets on, newspapers are made to be read by anybody, and in partaking of these things that is exactly who we become; anybody. One’s ownmost, individual Being (what Heidegger calls Dasein) dissolves into the kind of being of “the others”; indeed, in ‘the they’ everyone is the other and no one is him or herself. Heidegger calls this mode of being, the they-self. As we saw with falling prey though, das man is not intrinsically negative, nor is it to be avoided. It is our original (therefore existential), albeit inauthentic, mode of Being. Authenticity is therefore grounded in the they-self and we cannot simply dismiss it as something undesirable (unlike alienation for Marx). Sartre would have violently objected to the idea that humans are born with anything we might call an ‘essence’ or ‘nature’, however even for Sartre, there are essential facets to human existence, without which we wouldn’t be human beings in the first place. One of the most important of these is that humans are a combination of a transcendent consciousness (being-for-itself) and facticity (being-in-itself). With a metaphysics surprisingly similar to Marx’s notion of species-essence, Sartre holds that what makes the for-itself unique is the fact that it doesn’t coincide with its being. We are never this or that thing precisely because we are always consciousness of this or that thing. This holds true even, or perhaps especially, for our ‘selves’, hence Sartre notes that I am not my self; rather, I am presence to self. However, Sartre goes beyond this to point out that we are also, and at the same time, facticity. That is, we are, among other things, a physical body, as fixed and replete with being as consciousness is free and transcendent. This curious mix, not of two substances, but of one substance and one perspective, “not a unity which contains a duality… but a duality which is unity”, opens the door to another uniquely human behaviour, bad faith. Bad faith describes the situation where we take advantage of the ambiguity that lies at the core of human existence and either deny our transcendence (and therefore, our freedom) and try to be pure facticity, or vice versa, deny our facticity and assert our pure transcendence. Although Sartre doesn’t explicitly call this alienation, in a way, bad faith is alienating us from who we are; a conscious facticity, a duality which is unity. There are two considerable differences between this Sartrean alienation and the Marxist alienation we began this article with though. First is the source, second the solution. For Marx, capitalism imposes alienation upon us and we can free ourselves from it with communism. The alienation in bad faith on the other hand, is an unavoidable existential truth about our being. This also means that there is no easy solution (Sartre doesn’t offer one) and even suggests there may not be a solution at all. Bad faith is a condition of human existence. Sartre’s analysis of being-for-others is principally rooted in conflict. All our encounters with other people result in a metaphysical struggle for dominance, where I either become the dominant subject to the other-as-object, or the Other surpasses my own transcendence and reduces me to an object for them. On top of this pretty jaded view of human relations, Sartre also holds that, no matter how hard I try, the free subjectivity of the Other (and vice versa, of course) is always, fundamentally, inapprehensible. The nature of the for-itself as transcendence, pure freedom, means that it is always and forever beyond anyone’s grasp. As soon as the Other attempts to delimit me, circumscribe my freedom, fix me as some ‘thing’, my freedom automatically asserts itself and I escape their description of me just by being consciousness of it. It doesn’t take much imagination to interpret this as a form of alienation from our fellow humans. As with bad faith though, this is neither imposed on us from without, nor amenable to any solution. By nature of the consciousnesses we are and the nature of being-for-others, our alienation from other people, contra Marx, is a fundamental and unavoidable fact of human existence. 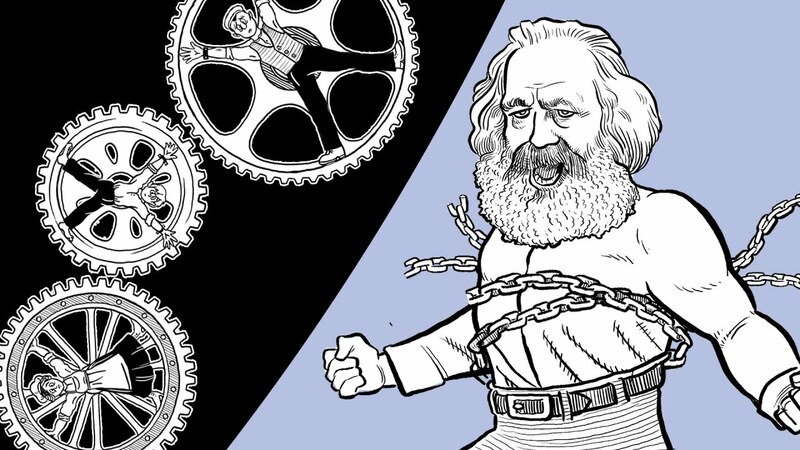 For Marx, alienation is brought about by capitalism and is a negative condition which needs to be resolved. Existentialist forms of alienation (at least as brought to light by this very limited investigation) tend to manifest in two ways; 1) from our own essential nature and 2) from other people. Moreover, in both of these cases alienation is neither forced on us nor something we can, or ought to, resolve. Alienation from our nature is typically seen as arising from some existential condition and therefore, even when it is acknowledged as inauthentic or in ‘bad faith’, it isn’t something which we can exorcise from our Being. Alienation from others also appears as either unavoidable or even, as in the case of Nietzsche, desirable and indicative of a strong, noble character. In general, it appears that alienation does feature strongly as a theme in existentialist philosophy (while seldom appearing specifically by that name), although it’s also clear that it usually only bears a slight resemblance to alienation as Marx conceived of it. This entry was posted in existentialism, philosophy and tagged Alienation, existentialism, Friedrich Nietzsche, Jean-Paul Sartre, Karl Marx, Martin Heidegger, philosophy. Bookmark the permalink.